Jarlsberg (/ˈjɑːrlzbɜːrɡ/; Norwegian: [²jɑːɭsbærɡ]) is a mild cow’s–milk cheese with large regular holes, that originates from Jarlsberg, Norway. Although it originated in Norway, it is also produced in Ohio and Ireland under licenses from Norwegian dairy producers. Jarlsberg cheese has a yellow wax rind (outer layer) and a semi-firm yellow interior. It is a mild, buttery cheese. The flavor has been described as “clean and rich, with a slightly sweet and nutty flavour”. It is an all-purpose cheese, used for both cooking and eating as a snack. It has a characteristic smooth, shiny-yellow body, and a creamy supple texture. It is aged a minimum of three months and is distinguished by medium to large holes. [unreliable source?] Some variations are aged a minimum of 9, 12 or 15 months. It is usually produced in 10 kg wheels with an approximate diameter of 330 mm and a height of 95-105 mm. The characteristic holes or “eyes” are the result of the action of the bacteria Propionibacterium freudenreichii which naturally occurs in milk and is added back to the cheese during production according to a closely guarded secret formula. Modern Jarlsberg cheese was developed in 1956 by Ole Martin Ystgaard of the Dairy Institute at the Agricultural University of Norway. Ystgaard’s interest was sparked by the thesis of a dairy sciences student, Per Sakshaug, on the cheese historically made in Vestfold. It was named for a Norwegian nobleman Count Wedel Jarlsberg (or the eponymous county) who owned land near Oslo in an area where an earlier version of the cheese was produced in the early 1800s. The recipe was developed from formulae originating with Swiss cheesemakers who moved to Norway at that time. “Jarlsberg” is a trademark first registered by Tine SA in 1972, and the exact nature and formula for the process of making Jarlsberg cheese is a trade secret. The largest producer of Jarlsberg cheese is Tine SA. Tine is the largest Norwegian dairy product cooperative. Jarlsberg cheese accounts for 80% of Tine’s total export. Tine’s United States subsidiary, Norseland, has sold 150 million 22 lb (10 kg) wheels of Jarlsberg cheese in the U.S. as of 2004[update]. Jarlsberg cheese was introduced in the United States in 1964. Imports to the U.S. in 1965 were 25 million pounds (11,000,000 kg). Since 1979 imports to the U.S. have been limited to 15 million pounds (6,800,000 kg). Jarlsberg is the most popular imported cheese in the U.S. As of 2004[update], 5–10 million pounds (2,300,000–4,500,000 kg) of Jarlsberg cheese was made in the U.S. in Ohio. It is also produced in Ireland by Dairygold. Annual sales of Jarlsberg cheese in the United Kingdom are £6.9m as of 2013[update]. Jarlsberg cheese is also popular in Australia. Jarlsberg is used as the topping of the Grandiosa, the best-selling frozen pizza in Norway. ^ a b c d e Rage, Arnfinn (1999). “Ch. 8: North European Varieties of Cheese § 4. Norwegian Cheese Varieties. 6. Jarlsberg”. In Fox, P.F. (ed.). Cheese: Chemistry, Physics and Microbiology. Vol. 2: Major Cheese Groups. Springer Science+Business Media. pp. 259–60. ISBN 9780834213395. ^ a b Hebert, Kristy (July 1, 2004). “Slice of Norway in Ohio cheese”. Farm and Dairy. Retrieved September 17, 2016. ^ a b c Blume, Aimee (February 2, 2012). “Cheese of the Week: Jarlsberg a good substitute for Swiss”. Evansville Courier & Press. Retrieved May 3, 2014. ^ a b c d Kipfer, Barbara Ann (2012). The Culinarian: A Kitchen Desk Reference. Houghton Mifflin Harcourt. p. 318. ISBN 0544186036. ^ “Jarlsberg® m/skorpe”. TINE.no (in Norwegian). Retrieved October 31, 2017. ^ “Jarlsberg Cheese 1 lb § Product Description” (product order page). Widmer’s Cheese Cellars. Archived from the original on August 15, 2009. ^ “Jarlsberg® Vellagret m/skorpe”. TINE.no (in Norwegian). Retrieved October 31, 2017. ^ “Jarlsberg® XO 15 mndr”. tine.no/osteriet (in Norwegian). Retrieved October 31, 2017. ^ a b c d Cloake, Patricia (September 12, 2013). “The hole truth about Jarlsberg cheese”. Word of Mouth. The Guardian (blog). Retrieved August 3, 2014. ^ a b c d Ehlers, Steve; Hurt, Jeanette (2008). “Part 2: Old World Favorites. Ch. 10: Scandinavian and Baltic Cheeses § Norwegian Jarlsberg and Other Norsk Favorites”. The Complete Idiot’s Guide to Cheeses of the World. Dorling Kindersley. pp. 102–3. ISBN 9781440636189. ^ “Detaljer”. search.patentstyret.no. Retrieved February 13, 2016. ^ Jenkins, Steven W. (1996). “The Scandinavian Countries”. Cheese Primer. Workman. p. 443. ISBN 9780894807626. ^ “Mastering the art of Jarlsberg cheese”. Laude. February 21, 2018. Retrieved December 13, 2018. 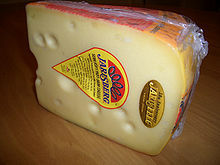 Jarlsberg.com U.S. site of brand owner.